End of summer blues got you down? Get up and drop some cash at the Rockstar Games Warehouse for their End of Summer Sale. Get 25% off of your favorite apparel and collectibles from some of their most popular games. The sale runs through Monday, September 8th, so you have a little over a week to take advantage. Rock a bit of the old school with a tee from the Red Dead Redemption Frontier Collection, or raid the Posters section to wallpaper your bedroom on the cheap with vintage snipes available from Manhunt, Red Dead Revolver, and the original Max Payne. Get ready for the end of summer holidays now, and stock up for the fall with some Original Soundtrack CDs, Caps, Kubrick Box Sets and a whole lot more. 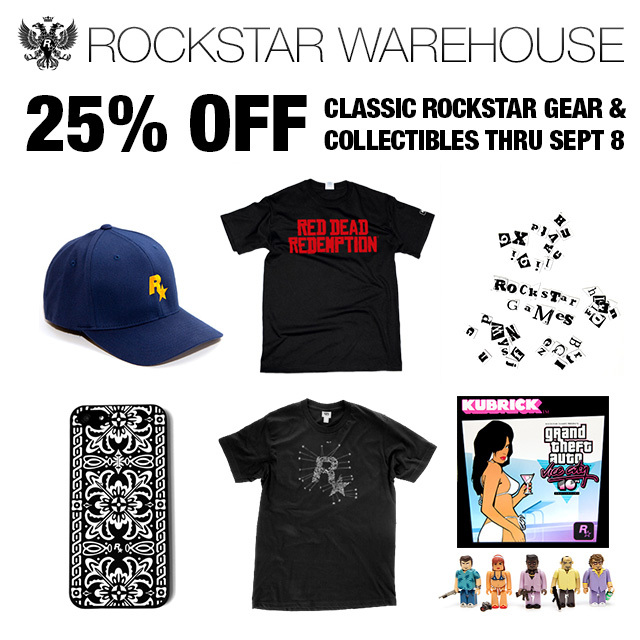 NOTE: This offer is valid on rockstarwarehouse.com only. Offer does not include any games or GTAV gear or collectibles. Offer does not apply to previous purchases, credits, or gift cards. Discount applied before shipping and taxes are added (if any). Offer valid through Monday, September 8th, 2014, 11:59pm Eastern Time US. ET is local time in New York City, USA. Offer cannot be redeemed for cash. Details of offer are subject to change and may be canceled without notice. Get going and join the fun at the GTA V forums!